This is Amber the Cavalier King Charles Spaniel x Bichon Frise. Cavachon for short. Her hobbies include napping, eating, looking for treats and more napping. As you’d imagine this combination has not done her any favours in the weight department. About two years ago I decided that I needed to substitute her current food for a healthier option. I did a lot of research and concluded that a raw diet was the way to go. However, despite what may people believe, raw is not best for all dogs. We had quite a lot of problems with Amber on a raw diet despite following feeding guides and seeking advice from experienced raw feeders. She did lose weight but that was about the only positive I did see. In the end I decided to take Amber off the raw diet and seek other healthy alternatives. At this point I hadn’t ever come across the concept of cold pressed dog food so put her on some grain free extruded (dry) kibble. I did this because as well as needing to lose a bit of weight, Amber had been having a lot of issues with her eyes streaming. This can often be liked to allergies, one of them being grain. The grain free kibble did help with the tear stains/ streaming however she put all of the weight she had lost on the raw diet straight back on. In addition to this she started having awful breath and tartar build up on her teeth. 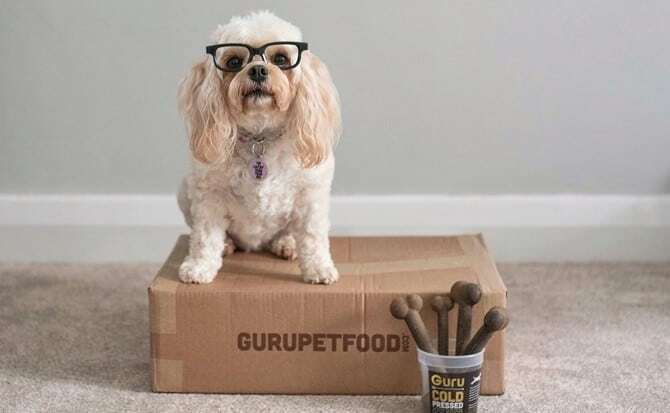 Yet again, I started researching new foods for Amber and coincidently came across Guru Pet Food on Instagram through @honeyb_doodle. I read about the benefits cold pressed food and it sounded perfect! 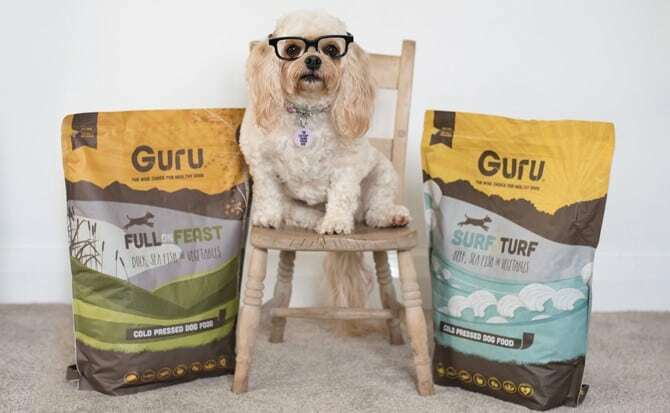 The Guru team very kindly sent Amber some samples of their Surf & Turf food around this time last year and she couldn’t get enough of it. At the beginning of June of 2016 I switched Amber over to Guru’s food and it’s the best decision I could have made regarding Ambers food. She has dropped from 9.6 to 9.2kg (we’re still working on getting her down to under 9kg but she’s well on the way). This may not seem like much but Amber had a period of time in which she couldn’t exercise for very long at all due to problems with her knee. So she was doing less exercise than she had been on her previous food and has still lost weight! 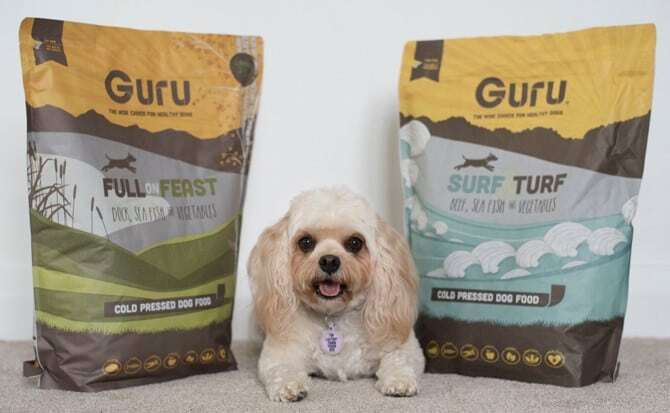 Once I had switched her over to Guru’s Surf & Turf her teeth didn’t get any worse than they had gotten on the grain free kibble I was feeding her and her breath did improve. A couple of months ago I had Amber’s teeth cleaned by the vets and since then she has had no tartar build up at all on her teeth and her breath is far better than it has ever been! Obviously I clean her teeth but Guru has definitely been a big help in keeping her breath nice and fresh. Her eyes also no longer stream anywhere near as much as they used to. They are actually better now than they were on the grain free kibble. I’m incredibly excited to crack open our bag of Full on Feast as this is cold pressed and grain free so I’m hoping her eyes will clear up even more! Amber and I have been on quite the journey to find the perfect food for her but I think we have finally cracked it. 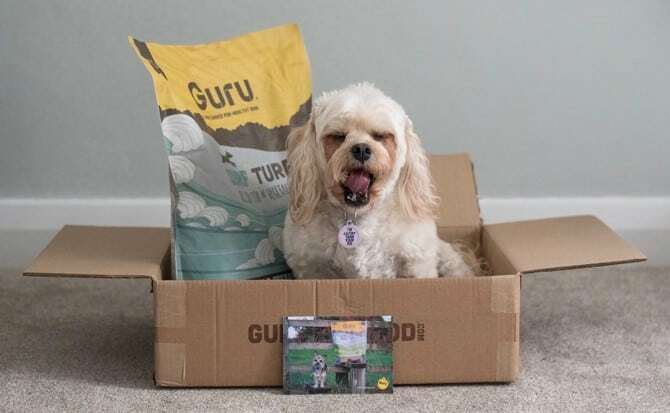 Guru is all I was looking for and more!